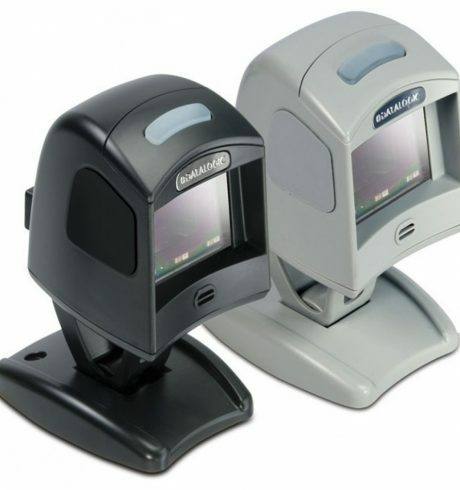 The Magellan is one of the most robust and compact presentation scanners on the market and has been an established player for a long time in retail, healthcare, libraries, as well as logistics. With the Magellan 1100i, you get an omnidirectional, on-counter scanner that impresses both in manual as well as counter operation through high processor and scan performance. It reliably reads 1D and 2D codes as well as images (different versions available) through improved imaging technology. The Illumix lighting technology further improves ergonomics provided by the patented Green Spot scan confirmation. This feature allows the device to also read codes from backlit surfaces such as mobile phones, PDAs or screen surfaces, whether in extremely dark or bright surroundings. Versions with a trigger and a targeting mode for scanning from lists, as well as optional EAS deactivation expand the application possibilities of the robust scanner (IP52) enormously. The device operates without moveable parts, making it an all-rounder in logistics and production. A quick pass over a surface or targeted selection of information increases the speed and provides for extremely efficient operation. A multi-interface and various stand options give you the necessary flexibility.